I don't recall ever hearing of Ashley Madison prior to news of of the recent hack, but since that happened, it's hard to open a news site or social media site without seeing a story about the effects of this hack on clients of the company. The widespread interest in this story seems driven in large part by titillation, but also by schadenfreude at the unmasking of hypocrites. Reactions to this story intrigue me in part because I am writing a paper called "True Loyalty," which talks about what we can learn about fiduciary law from common understandings of loyalty. It seems safe to say that we care about loyalty a lot, at least in this context. But the impulse to flag hypocrisy wherever it surfaces (especially when it is connected to people we already dislike) is troubling to me. This impulse is much in evidence in the political arena, but, as a matter of personal well being and public good, I think it is worth guarding against this impulse, choosing instead to be generous in the face of limited knowledge. Thinking more specifically about the Ashley Madison situation ... in my volunteer church work, I counsel regularly with people who are having marital problems. More often than I would like, I find myself crying with people who have wronged their spouses or with the spouses who have been wronged. My sample is limited to those who are seeking help, but, in these cases, the person who has cheated wants desperately to take away the harm they have inflicted on their spouse. They are struggling to deal with the tragic disjunction between their principles and their practices. They want to make things right, but they seem to sense that they lack the ability to do that, which is why they are in my office. After you do this a few times, it's hard to see a story like Ashley Madison without feeling anything but sadness for everyone involved. "People make mistakes. People go through rough patches, and explore things, and sometimes it goes somewhere but sometimes it doesn't. And I think it should be okay to wrestle with one's own instincts. We all do. And we all do stuff that goes against even our own principles sometimes." How much better the world would be if we could all remember this! Welcome, Guest Blogger Josephine Sandler Nelson! Josephine comes to us from gigs at Stanford's and Berkeley's business schools; she writes about corporate crime, among other things - papers here. Welcome Josephine! Bloomberg Law sounds like old school AM radio, with AM newsy questions and radio voices. It's really pretty useful with one in depth story and some headlines, and they spend plenty of time on business topics. The Gist, with Mike Pesca, is a new daily thing that is a combination of NPR, low production values, and personality-driven AM radio. Not businessy, but I really like it so far. Somebody compared it to a meatball sandwich with a really gooey fontina. Double speed playback. Absolutely essential if you're going to get through these, the other podcasts I enjoy, and various entertaining history podcasts, like classes at Yale, the History of Rome, the History of England, the History of Byzantium ... and you get used to the fast-talking pretty quickly. I now try to mimic it in my daily life, much to the consternation of my family. Looking to the future of legal education and the legal services industry, the University of Chicago announced today a radical new curriculum that respond to claims that law school is too expensive, too long, and irrelevant to the delivery of legal services. These changes will go into effect beginning with the incoming class of 2014-15. A new orientation day will replace earlier attempts at "welcome to law school" programs. New legal careers will begin on Day One. On this day, students will be given a type of aptitude test that will tell students in which broad legal field they may thrive in and in which they are most likely to find satisfaction. The results of these tests are confidential and not mandatory, students will be able to choose the next day which field of study they will enter; however, this choice is irreversible. Chicago has announced five fields of legal study, which will be organized into "factions": Abnegation, which will focus on public interest work and "street law;" Amity, which will focus on dispute resolution; Erudite, which will focus on the most cerebral of legal work, corporate, securities and tax law; Candor, which will focus on governmental agency work; and Dauntless, which will focus on litigation. Each field of study will require different lengths of training. Dauntless training will be completed in three months by zip-lining from the Sears Tower through downtown Chicago. Erudite training will take six years and take place exclusively indoors. However, should a student drop out or be counseled out of training, the student will be "factionless," or in other words be unable to sit for the bar unless a law school beyond the fence is willing to retrain the student. The law school acknowledges that some educators (and parents) believe that some students may have skills or talents that could serve them well in different factions; however, this gifted "divergent" student is more myth than reality, according to experts. Sometimes you have more to say than fits into a Facebook post. That's why I'm glad I have a blog. A million years ago, I was in the 9th grade at J.T. Hutchinson Jr. High in Lubbock Texas. "Hutch," as we called it, was home to the junior high magnet program. One of the highlights of the program was taking Biology from Charles H. Swift, who has just recently passed away at 73. Imagine a hospice room with daily visits from 35 years of students. I can't even imagine how full the memorial service will be. It would take me too long to tell you all about Mr. Swift, who taught us good-for-nothings in a vast lab full of animals; some dead, some alive. You never knew when you walked in if you would have a pop quiz, be put in a dark closet with scorpions and a black light, or be treated to one of Mr. Swift's soliloquys on life, but any way was going to be good. I will always remember Mr. Swift telling us repeatedly that the secret to life was taking Spanish, learning to type and giving blood. I have followed this formula to great success. But the memory that stands out for me is "Spring Trip." Every year, Mr. Swift took 60 9th graders on a yellow school bus all over the state of Texas. For those of you who are geographically challenged, Lubbock is in the Northwest part of Texas, a good six hours from anywhere. I know I am missing some stops, and probably not in the right order, but we left Lubbock the Friday night that started Spring Break and returned the next Sunday evening. We went to Juarez, Mexico, San Antonio, Austin, Houston, Galveston, Davy Crockett National Park, and who knows where else. We took sleeping bags and a tarp and slept outside, at least once in the rain. We got food at grocery stores and a few cafeterias. At least one night we cooked outside. There may have been one shower the whole week. I don't remember anyone complaining. These days, 9th graders have been to Europe, New York, Asia, who knows. But we hadn't. No one in that group had been anywhere as far as I knew. But we saw everything that needed to be seen in Texas that week. I can't even imagine taking 60 15 year-olds (boys and girls!) anywhere, and I definitely can't imagine getting them to sign on to such a "no frills" trip in this modern era. But we all had an amazing time, and when we see each other, that's all we talk about. I remember once in high school getting ready to go on a Biology II field trip, and one of our classmates whose parents wouldn't let him go on the Spring Trip pleaded with us not to start any sentence with "Remember on the Spring Trip that time. . . . ?" Sometimes someone will ask me how I got up the nerve to talk 15 law students to Malawi over Spring Break. Well, I had a good teacher. R.I.P., Mr. Swift. Is The DC Court of Appeals The Second Most Credentialed Court In The Country? It's not exactly core business law, but if you want to be an appellate judge, you aren't going to find the District of Columbia a very amenable place to do it. The D.C. Circuit, fine, one would assume that that would be a tough ask. But might it be harder to get on the City's Court of Appeals? Here's some evidence. Todd Kim's name has been sent to the president; he's DC's solicitor general, and a tremendous lawyer (and my former co-clerk, but that's not here nor there). One of the other candidates is a partner in Wilmer's appellate practice, clerked for Byron White, and has argued a bunch of cases in the Supreme Court. The other is a veteran judge with a Fifth Circuit clerkship to his name. How many finalists for other state supreme courts uniformly have federal appellate clerkships? Do you experience feelings of "time famine" -- the feeling of having too much to do and not enough time to do it? This is a pretty common feeling with me, so I am intrigued by this paper from Melanie Rudd, Kathleen Vohs, and Jennifer Aaker entitled "Awe Expands People’s Perception of Time, Alters Decision Making, and Enhances Well-Being." Relying on three experiments, the authors conclude that "awe, defined as the emotion that arises when one encounters something so strikingly vast that it provokes a need to update one’s mental schemas ..., can expand perceptions of time availability." If you don't feel that you have time to read the paper (ahem) ... at least watch the video. 1. I mightily enjoyed Glom emeritus Vic Fleischer's Standard Deduction column explaining why Facebook is paying the tax tab on employee compensation. Answer: it really isn't, and it has to go through these machinations because of Zuckerberg's use of restricted stock unit awards instead of restricted stock to compensate employees. And that's because he wanted to keep the total stockholder number below that old, defunct-thanks-to-the-JOBS-Act magic number 500. Good stuff. 2. Congratulations to TOTM's Josh Wright, nominated to be the next FTC Commissioner. Of course, as a legal academic blogger Wright already commanded vast amounts of prestige and influence. I'm sure the FTC will be nice, too. We're cheered to see our emeritus blogger Vic Fleischer take up a new column for the Times's Dealbook. You'll want to add this to your Google Reader, and if you want to get some of the I knew him when, look in our archives here. Trending on my FB this week was an article by Kyle Wiens, CEO of iFixit, called "I Won't Hire People Who Use Poor Grammar. Here's Why." The article, from the website of the Harvard Business Review, went on to explain that Wiens gives every applicant a grammar test, regardless of whether writing is a part of the particular job description. I don't get the sense that the grammar test is unduly hard -- there's probably no testing of the use of the subjunctive ("I wish I was in Paris right now"/"I wish I were in Paris right now") -- but maybe it tests basic punctuation and common mistakes such as "their/they're/there." Wiens explains that for every job at his company, he wants someone who is detail-oriented and pays attention: "If it takes someone more than 20 years to notice how to properly use "it's," then that's not a learning curve I'm comfortable with." The responses in the comments were shocking to me. I would think that if I were reading the HBR, my first response would be "Wow. I wonder if other people think like that, too. Let me go check my resume." But apparently, that was not the modal response. You're a pompous [___]. That was the number one response -- the "kill the messenger" response. I'm not sure why thinking grammar is an important life skill is being pompous. (I'm not even sure that "pompous" is the word commenters meant.) Wiens didn't say that he hired only people who learned a foreign language or played a musical instrument, both of which would reflect certain qualities or abilities that might make for better employees but reflect a certain kind of education or upbringing to which not everyone has access. It's not that expensive to learn when to use the possessive apostrophe. Your article has errors. This is the "defense mechanism" response. From arguing that not all the words in his title should be capitalized (n.b. -- the title is correct according to the Chicago Manual on Style and the MLA) to criticizing his ending a sentence with a preposition, readers were all over him. Some argued that Wiens used the term "grammar" when his examples were mere mistakes in spelling and punctuation, not syntax. Others discounted his thesis because one of his colorful examples seemed to use the term "apostle" and "disciple" interchangeably to describe a particular set of folks in the New Testament. However, none of these quibbles, even the few that were accurate, refutes the proposition that errors on a resume or the inability to pass a "grammar" or "punctuation" test gives information to prospective employers about an applicant's attention to detail. My take. If my son or daughter were applying for jobs, I would share this article. The reader might be persuaded that yes, grammar makes the employee, and be more careful to keep "texting language" separate from "work language." Or, the reader might disagree, but might accept that those with the power to hire her think likewise. In that case, the end result should be the same. Perhaps it's like polishing your shoes. Does having polished shoes make you a better employee? No. Does being the kind of person who ritually polishes his shoes mean that you are a better employee? Maybe, maybe not. Does being the kind of person who thinks that a prospective boss might notice the scuffiness of his shoes and think poorly of him, so shines his shoes before an interview mean you will be a better employee? Yes. I know many Americans send their dogs off to dreamland each night by saying, "You're the best dog in the world. Yes you are!" But they are all mistaken. Hank was the best dog. Ever. He sat beside me throughout grading legal writing memos and BA exams, writing articles and editing books, prepping for class and writing movie reviews. He stoically endured the births of three children and the introduction of two cats. He survived vet malpractice and the heartworms that went undetected for over a year, as well as glaucoma and the removal of one eye. We lived in six different houses the last 14 years, but it didn't matter to him because his home was curled up beside me. And for the last few years, we knew we were living on borrowed time with our one-eyed cowpoodle who couldn't hear us much anymore. I posted this photo on the blog in May 2005, and it's how I remember him. There's a movie trailer out right now with a little boy telling his parents that he doesn't want his dog Sparky to be in heaven, he wants him to be there with him. We know how he feels. 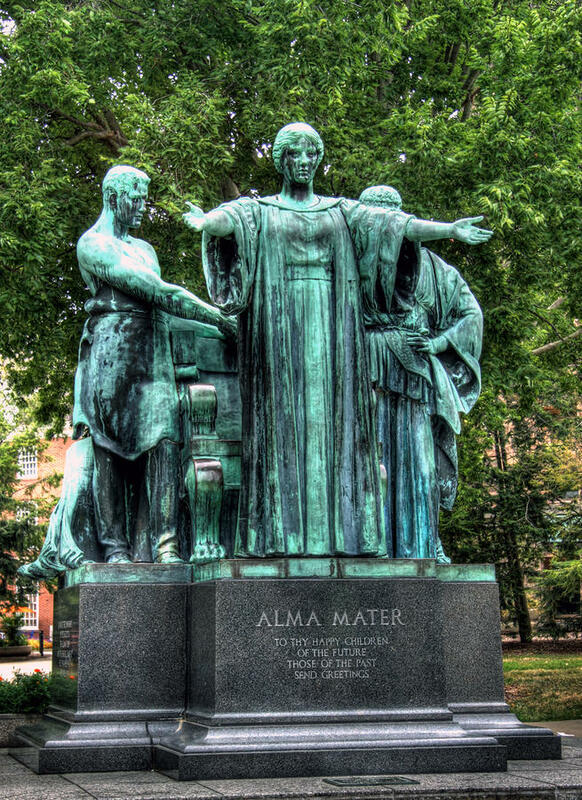 The Alma Mater Statue at University of Illinois Takes a Spa Year. If you are an alumni of the University of Illinois, then the Alma Mater statue probably has a special place in your heart. I merely have the privilege of teaching here, and I love this statue, which welcomes you to campus. The words on the base of the statue send shivers: "To Thy Happy Children of the Future, Those of the Past Send Greetings." Alma Mater gets decorated for graduation, holidays, etc., and children young and old climb all over her. So, Alma Mater is going off-campus for some refurbishing. We will miss her until she returns. "You want go home, Schettino? It is dark and you want to go home?" From the transcript (translated) of the conversation between Captain Francesco Schettino, commander of the grounded Costa Concordia, and Captain Gregorio De Falco of the Italian coast guard in Livorno. Schettino was ordered to go back aboard his listing ship, but the coast guard said he did not go back. Schettino was arrested on land.